Rhoda Waters - Heritage Funeral Homes Inc.
of Kenilworth passed away peacefully on September 19, 2018 at Wellington Terrace Long Term Care Home. Beloved wife of Ken Waters (2014). Dear Mother of Mervin of Baden, Patricia of Kenilworth and John and wife Cecilia of Kenilworth. Much loved Grandma of Shane and Christine, Chad, Ryan, Calvin and Andrea, Brooke & Josh Heiliger. Also survived by ten great-grandchildren. Fondly remembered by her nieces, nephews and friends. Predeceased by her parents John and Janet (Mainland) Rendall, four brothers, Norman, George, Robert, Hugh, four sisters Donalda Povey, Mary Martin, Ruth Robertson, Clara Arthur and Daughter-in-Law Janet Waters. Born in Arthur Township October 25, 1924. Rhoda received her RN degree from K-W School of Nursing in 1946. While raising her family she did private duty nursing and worked with the Public Health in the school programs. She worked along side her husband to establish one of the early registered Holstein herds. Later in life she founded and operated two successful businesses. 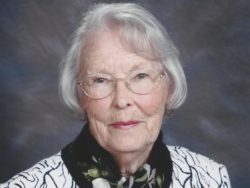 She was an active member of the Arthur United Church, Agriculture Society and a volunteer with Hospice Wellington. She loved nature and the outdoors. Family and friends are invited to a Funeral Service of Remembrance at Arthur United Church on Saturday, September 22, 2018 at 1 p.m. followed by internment in Greenfield Cemetery. As expressions of sympathy donations to the Arthur United Church or charity of your choice would be appreciated by the family.